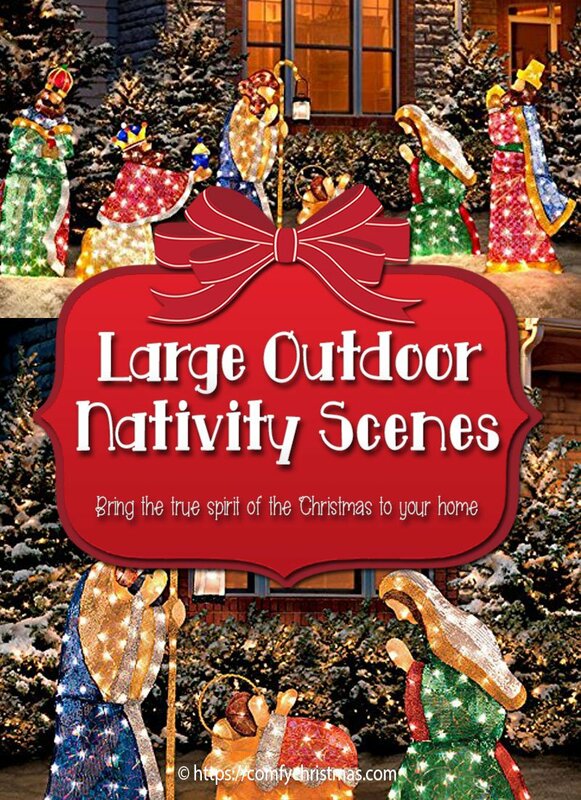 Are you looking for Large Outdoor Nativity Scenes? 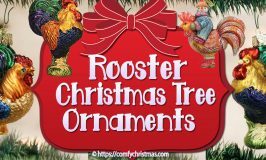 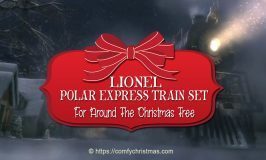 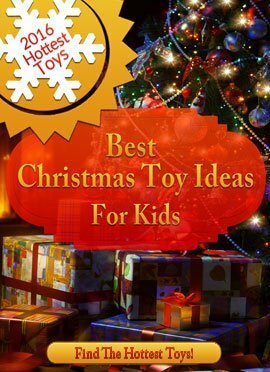 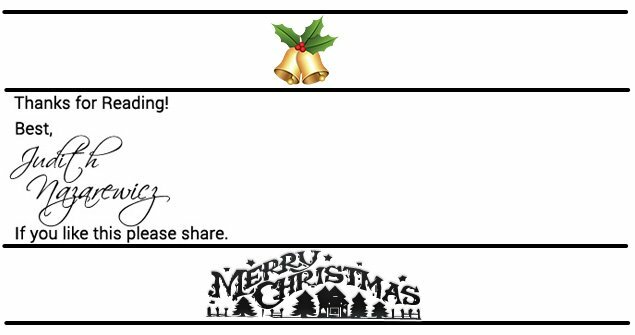 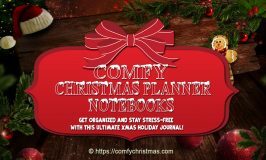 When it comes to the holidays and Christmas we find that it is one of the busiest times of the year. 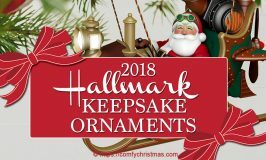 If you’re on a Budget make sure you check out all the ! 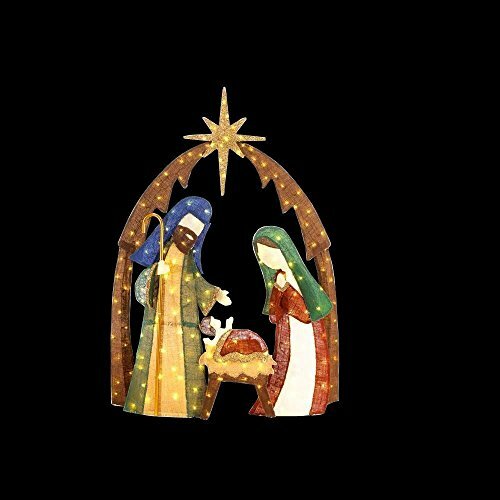 With all the festivities and gift giving we tend to forget the real meaning of why we celebrate Christmas. 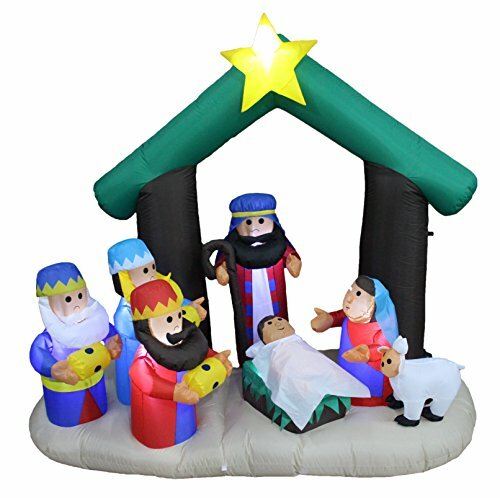 We celebrate the birth of Jesus on Christmas and what better way to to remind people of the real meaning of Christmas than to use a Nativity decoration that will recreate the first scene when Jesus was born in the manager. 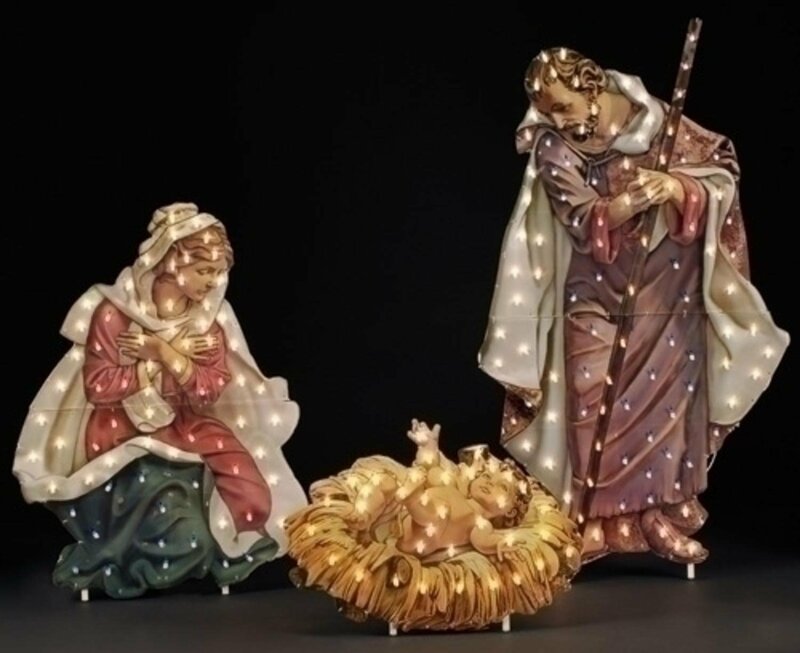 Many of us set up Nativity scenes indoors but why not set up a beautiful Nativity scene in your front yard to remind all the passer-bys of the real meaning of Christmas. 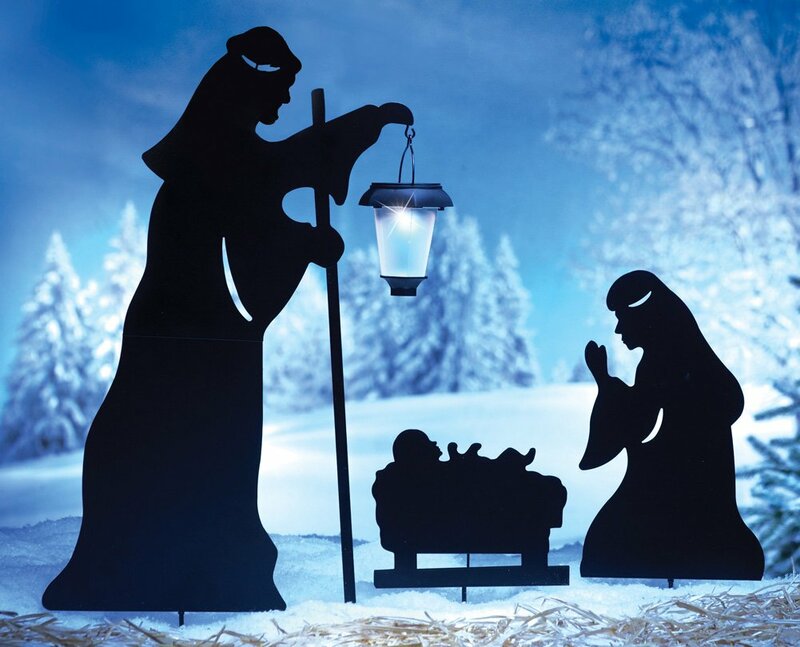 This very well made large outdoor Nativity Scene is over 4 Feet Tall with assembled dimensions that are 44″ wide x 50″ tall x 28″ deep and is made out of heavy duty 1/2″ thich PVC that will last for years. 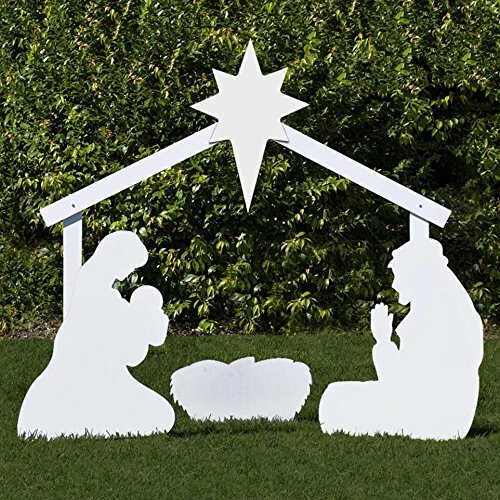 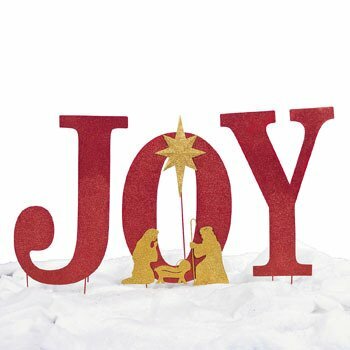 This large outdoor Nativity Scenes comes with aluminum rods for support and ground stakes. 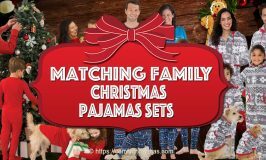 You might want to dress it up with twinkle lights. 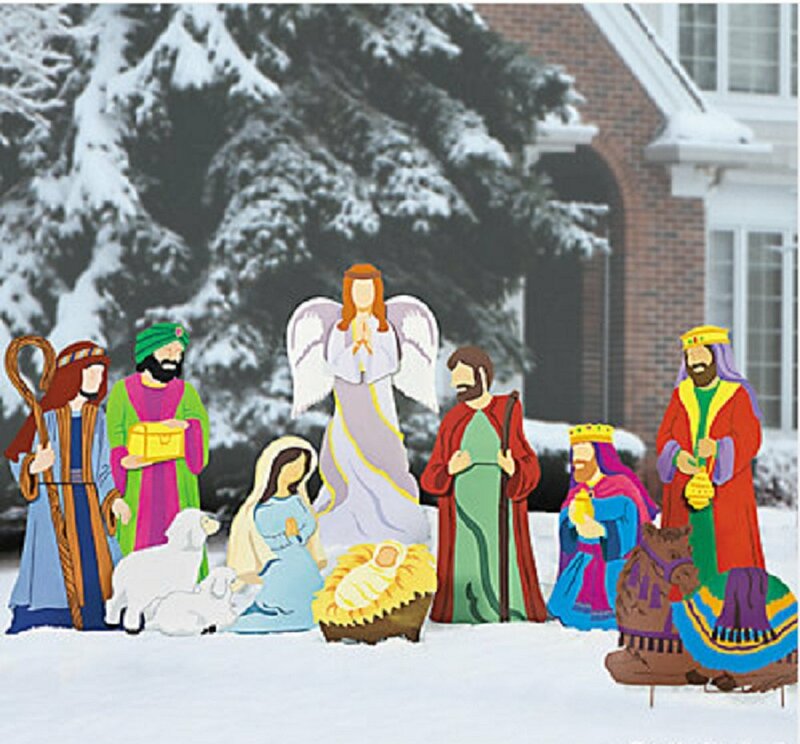 With thislarge deluxe Nativity 10 piece set you can create your own Outdoor Beautiful Nativity scene. 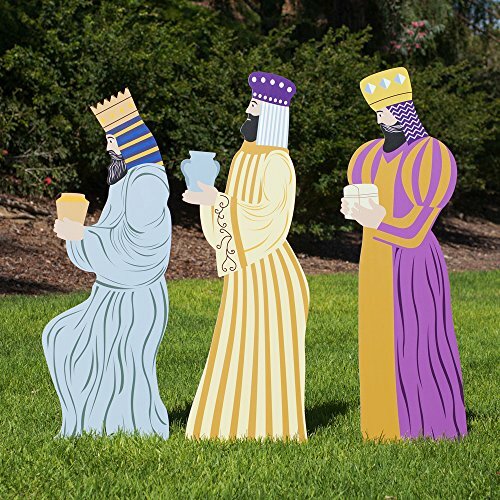 The set is made of weather resistant tin that is durable coated painted metal. 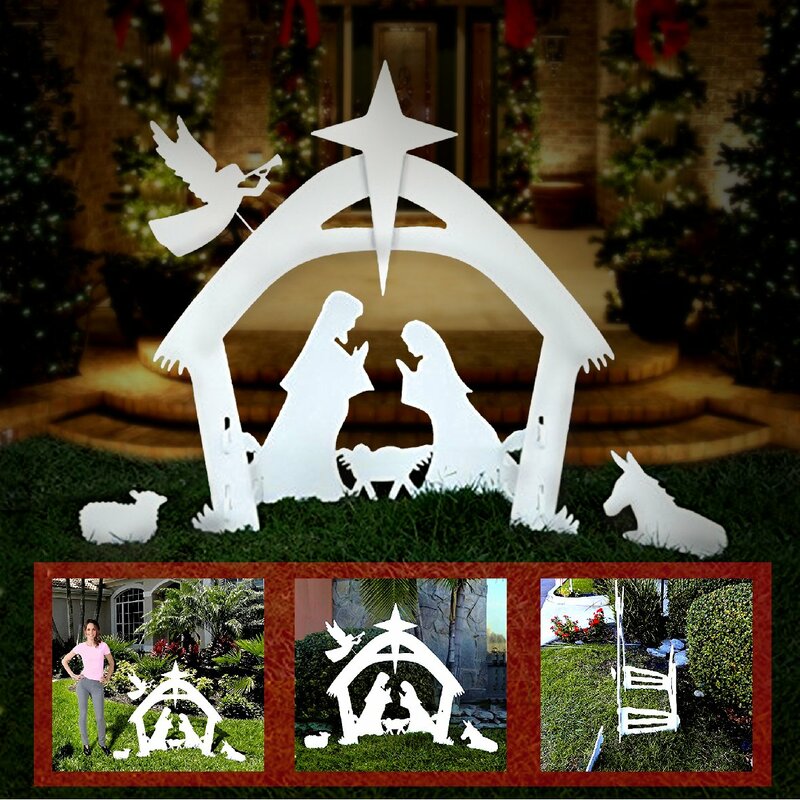 Each piece has it’s own stakes on the bottom and has a pull-out metal bracket on the back. 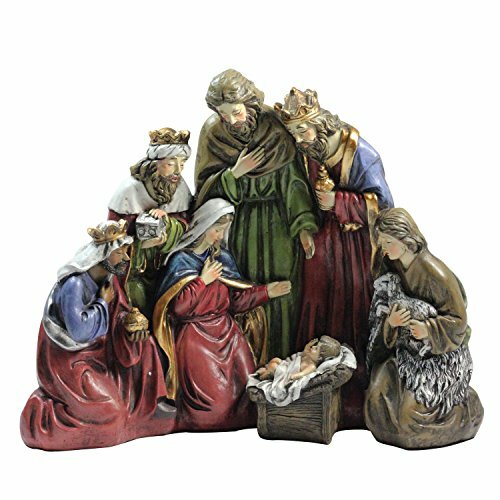 If you are looking for a colorful nativity set this is beautiful with pieces standing about 48 inches high`. 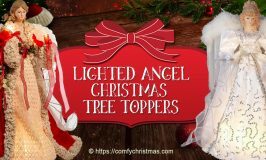 Note: These can be bought as a set or as individual pieces. 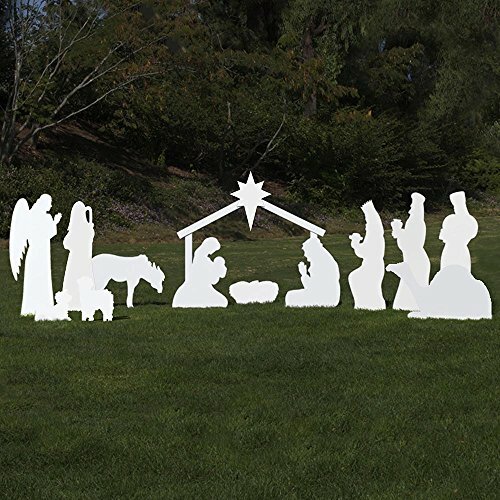 48 inches tall Fontanini Holy Family Lighted Nativity Christmas Yard Art that includes Mary, Joseph and Baby Jesus. 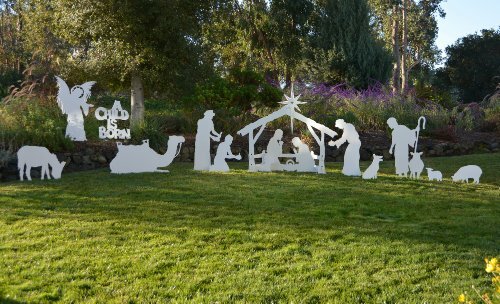 This outdoor nativity scene comes with 200 Clear Mini Lights. 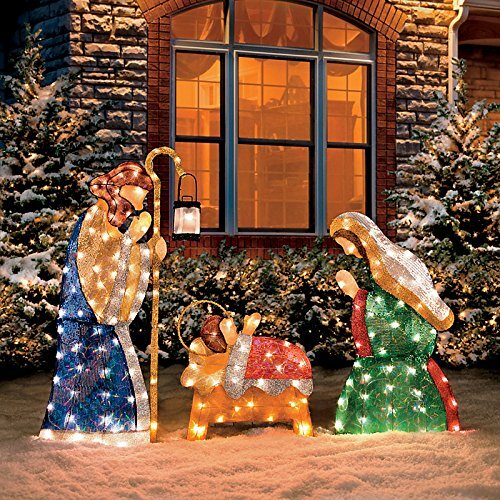 These shimmering large outdoor Nativity Scenes express the true meaning of Christmas. 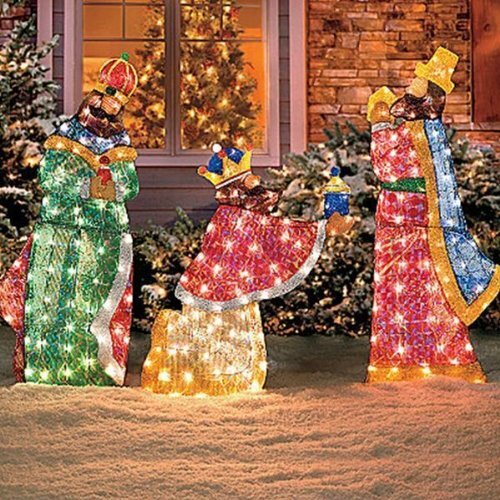 Graceful 2-dimensional Shimmering Holy Family and Wiseman figures are designed and made of colorful sequined materials and glittery tinsel. 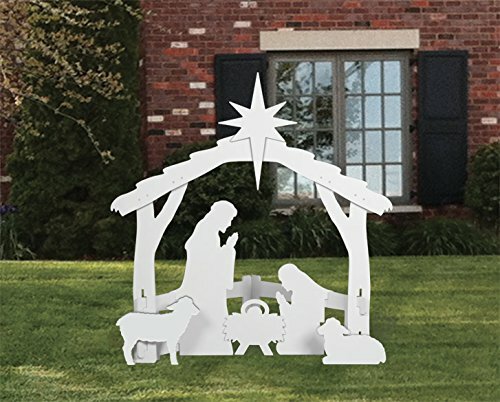 This nativity set is made for indoors or outdoors and are easy o assemble and takedown for easy storage. 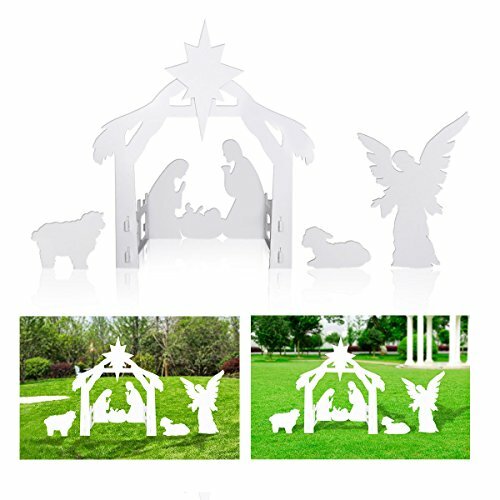 Bring the true spirit of the holiday to your home with this outdoor solar Christmas Nativity Shadow with LED Lighted Lantern. 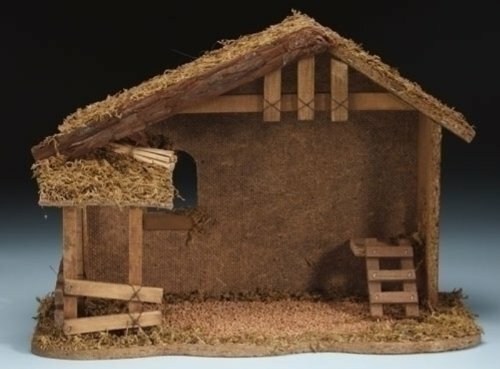 This Nativity scene is not that large however, when set up produces a much larger shadow on a wall. 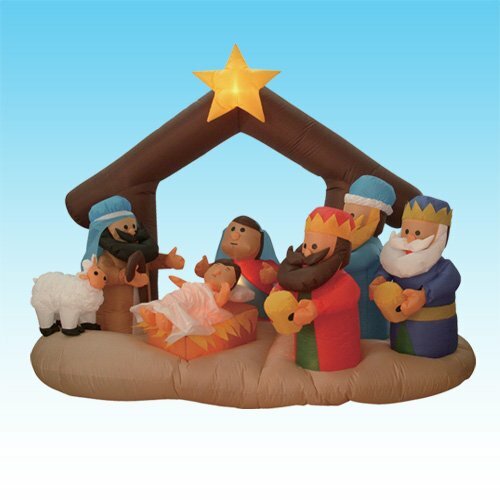 The set includes staked figures of Mary, Baby Jesus and Joseph who holds a solar-powered lantern that lights at dusk. 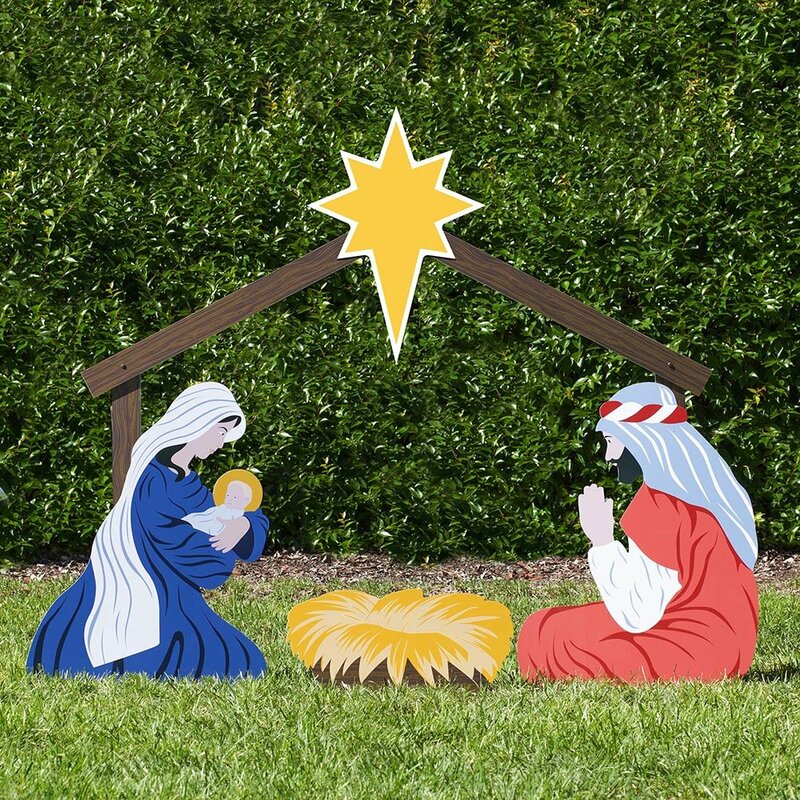 The set is made of metal and is quite light but comes with iron stakes that you can anchor securely anywhere in your yard. 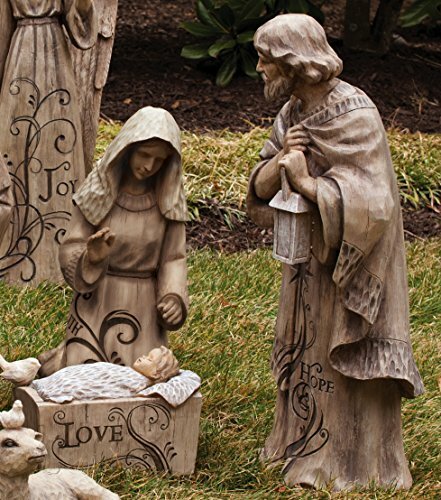 We hope you enjoyed this page on Large Outdoor Nativity Scenes and be sure to check out some of our other Yard Decorations pages.